Henrik Fisker is a risk taking, innovation loving, protocol challenging legendary designer & entrepreneur who turns dreams into reality, and believes in never giving up. An entrepreneur, creator, innovator, mentor, brand ambassador and a leading automotive designer. Best known among his creations are iconic cars such as BMW Z8, Aston Martin DB9, Aston Martin V8 Vantage, Artega GT, Fisker Karma, Viking motorcycle, Rocket and more recently Destino V8 and Force 1. Henrik Fisker is the founder, Chairman and CEO of Fisker Inc., an American automaker based in California USA, revolutionizing the development of electric vehicles with game changing battery solutions. Previously, Henrik Fisker founded Fisker Automotive in 2007 as the world’s first green luxury lifestyle automotive company, and took the idea from conception to a team of 600 people, from concept to full scale production, and sales of the company’s first model, Fisker Karma that sold more than 2000 vehicles. Under the leadership of Henrik, Fisker Automotive won numerous awards, including 2012 Time Magazine Best Inventions of the Year. Henrik Fisker resigned from Fisker Automotive in March 2013 due to major differences with management on strategy. In January 2016, Henrik Fisker cofounded VLF Automotive with Bob Lutz and Gilbert Villarreal, an American luxury sports car manufacturer based in Auburn Hills, Michigan that specialized in low volume, specialty cars. Henrik Fisker is head of design and product strategy at VLF, that currently has 3 models the VLF Destino V8, VLF Force 1 V10 and VLF Rocket. In 2016, HenrikFiskerlifestyle was launched, a lifestyle brand dedicated to creativity, innovation and entrepreneurship. In June 2013, he founded and currently serves as the CEO of HF Design, a design and innovation company developing a number of first-to-market consumer products in categories ranging from automotive, lifestyle, homeware, education and smart devices. The company announced a partnership with Benetti Yachts in April 2016, launching a 164-foot super yacht series called the Benetti Fisker 50. Previously, Henrik founded Fisker Coachbuild in 2005, an automotive design house that revived the art of coachbuilding by combining beautiful design with existing world-class engineering. Fisker Coachbuild created cars such as the Artega GT (German sports car), and the Fisker Latigo & Fisker Tramonto. From 2001 to 2005, Fisker held prominent executive positions at Ford Motor Company. He was creative director at Ingeni, Ford’s London-based design and creativity center. At the same time, Fisker served as Board Member and Design Director at Aston Martin in Gaydon, UK. As a board member, Fisker was part of a team that led the turnaround of Aston Martin. Henrik designed the Aston Martin V8 Vantage and was responsible for the production launch design of the DB9, variants of which were James Bond’s preferred vehicles. 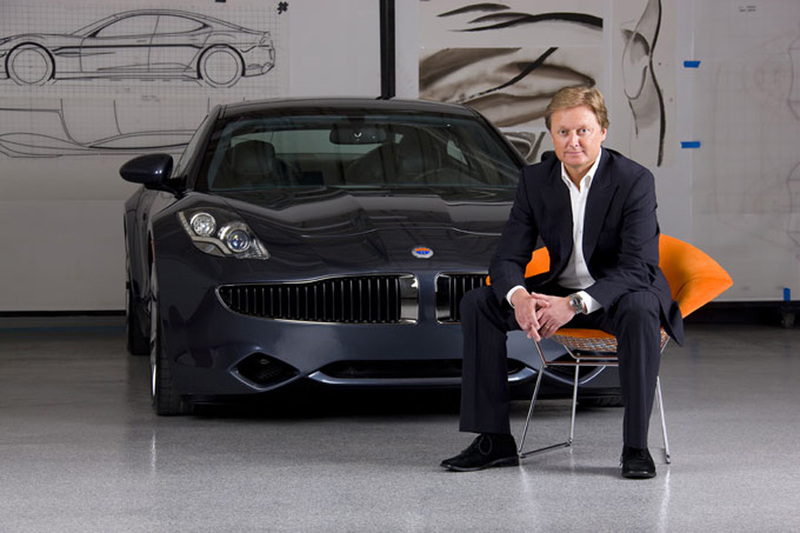 Fisker was also director of Ford’s Global Advanced Design Studio in southern California. Designed under his direction were several show cars including the Shelby GR1 concept showcased at the 2005 North American International Auto Show. From 1997-2000, as president and chief executive officer of BMW Designworks USA, BMW’s California-based industrial design subsidiary, Henrik led a team of 130 people and was responsible for both internal and external clients. Henrik created notable cars such as the BMW Z07 concept (1997) and BMW Z8 roadster (1999), another Bond car. Henrik sits on the advisory board of Panasonic Aviation and is a senior advisor to McKinsey. Previously he has held board positions at Fisker Automotive, Fisker Coachbuild, Advanced Lithium Power, Aston Martin and BMW Designworks USA. He has held several honorary roles as Judge for 2012 Pebble Beach Concours d’Elegance for best in class, elegant design category and 2010 Advisor and Judge for Royal College of Art, UK in Automotive Design. Henrik was previously brand ambassador for Swiss Watch Maker Maurice Lacroix. He graduated in Transportation Design from Arts Center College of Design in 1989.